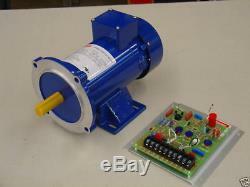 DC Motor & Control Package. Input - 200 240VAC + 10%, Single Phase.. Output - 180 VDC (arm), 3.75 amps. Input Current - 3.75 amps. Acceleration/Decelaration - Adjustable 0 150%. Motor Speed - 1800 rpm. Torque Current Limit - Adjustable 0 10%. Motor Frame - TENV / 56C. Minimum Speed - Adjustable 70 100%. Motor Insulation - Class F. Maximum Speed - 0 10%. C-Face Diameter - 4.5 inches. Drive Height - 6.8 inches (173mm). Shaft Diameter - 0.625 inches. Drive Width - 6.4 inches (163mm). Motor Height - 7.3 inches (185 mm). Drive Depth - 1.7 inches (43mm). Motor Length - 11.7 inches (297 mm). Drive Weight - 2 lbs. Motor Diameter - 6.1 (155 mm). Motor Weight - 27 lbs. Also included are Two spare brushes for the motor & Potentiometer for the drive. Additional drive capabilities are available in different drive configurations. The item "3/4 HP, 180 VDC, DC Motor and Variable Speed Control" is in sale since Wednesday, February 6, 2019. This item is in the category "Business & Industrial\Automation, Motors & Drives\Drives & Starters\Drives & Motor Controls\Speed Controls". The seller is "driveswarehouse" and is located in Dallas, Texas. This item can be shipped to United States, Canada, United Kingdom, Denmark, Romania, Slovakia, Bulgaria, Czech republic, Finland, Hungary, Latvia, Lithuania, Malta, Estonia, Australia, Greece, Portugal, Cyprus, Slovenia, Japan, China, Sweden, South Korea, Indonesia, Taiwan, South africa, Thailand, Belgium, France, Hong Kong, Ireland, Netherlands, Poland, Spain, Italy, Germany, Austria, Bahamas, Israel, Mexico, New Zealand, Philippines, Singapore, Switzerland, Norway, Saudi arabia, Ukraine, United arab emirates, Qatar, Kuwait, Bahrain, Croatia, Malaysia, Chile, Colombia, Costa rica, Panama, Trinidad and tobago, Guatemala, Honduras, Jamaica, Viet nam, Uruguay.